The meeting point is in Via Leone IV, n° 33 just 200 meters from the nearest subway stop Cipro-Musei Vaticani. On Wednesdays St. Peter’s Basilica (visit inside daily, except on Wednesdays 8:00 am departures, it will be replaced with the Vatican Library) due to the Papal Audience. The Basilica is an active place of worship and may be closed without prior notice for religious events: in this case the visit will be substituted by a visit to the Vatican Library. This tour ends in St. Peter's Square. This tour visits religious sites, and there is a dress code to be observed. Visitors must be dressed appropriately: no sleeveless blouses, no miniskirts, no shorts, and no hats are allowed. Did you know that the Vatican Museums are nine miles long? And that they are in the top five of the most visited galleries in the world? If you are looking for a really no-stress tour of their dazzling art collections, we suggest you get this skip-the-line semiprivate tour. We have designed a group of 11 people maximum exactly to let you enjoy a personal, customized experience with your guide and travel companions. 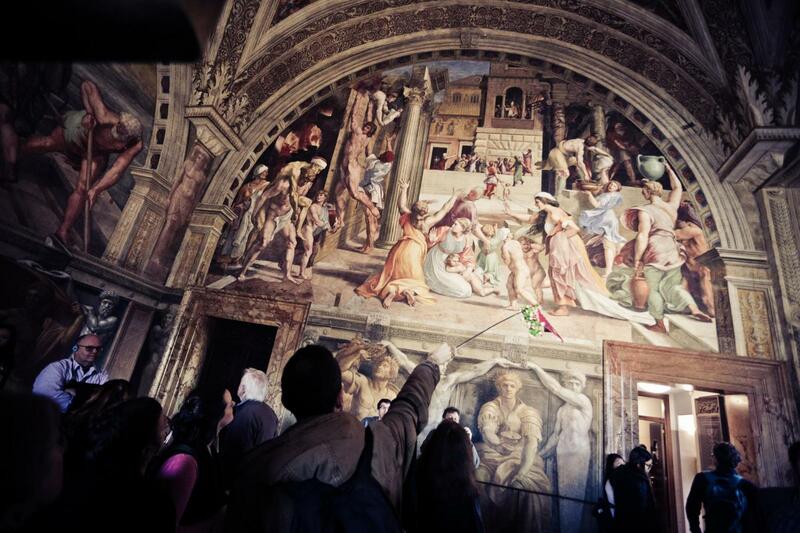 Thanks to our real skip-the-line tickets and to the experience of our guides, you won't waste a single moment of your visit and won't miss any of their most suggestive artworks, like Michelangelo's Sistine Chapel. When you arrive, your guide will lead you to the Museums through our reserved Official Partners entrance. Then, you will be able to admire their most impressive Renaissance art places: the Gallery of Tapestries, the Gallery of Maps, the stunning Raphael’s Rooms and the world-famous Sistine Chapel. After the Sistine Chapel you will be taken, through an exclusive access to St. Peter’s Basilica, skipping long lines. Of course, you won't have to worry about the other visitors nor of losing your group. We always guarantee headsets to our guests, in order to let them always enjoy both guide's commentary and their own pace for curiosities and photos.